With its gorgeous Hello Kitty Flower Dance design fabric, this is a fabulously cute and eye-catching Bouncer that comes with a removable toy bar to keep your baby occupied. Featuring 5 different melodies and 3 soothing sounds, this provides your baby with plenty of extra stimulation as well as a vibration option to help soothe and relax your baby. It’s super comfortable and chic and its deep cushioned seat will really cradle your precious load. Suitable for a newborn of 6 lbs. up to a 2 year old with a weight of no more than 25 lbs., you will get plenty of use out of this Baby Trend Bouncer and be sure to look stylish and on trend too. The flower dance design means that it’s probably better suited for a baby girl but that’s all a matter of individual choice. This fashionable and cute designed Baby Trend Bouncer is perfect for a newborn through to a toddler and can carry weight up to a good 25 lbs. Featuring gorgeous Hello Kitty flower dance fabric it’s perfect for the stylish parent who wants to really make a bold and fun statement. At the same time, it also provides baby with the ultimate in comfort and amusement as it’s stacked with lots of sensory features for your baby to play with including a range of on-board interactive toys and an electronic music center as well as a calming vibration function. With removable seat pad and head rest it can also be handily machine washed whilst the frame itself can simply be wiped down clean with a damp soft cloth. Whilst it might not be foldable, its small and light weight frame mean that it is easy for you to carry around. Perfect for the parents who want to provide their baby with plenty of early development and sensory stimulation, this Baby Trend Bouncer is both affordable and looks stylish and chic. If you want to ensure that your baby is safe, comfortable and at the same time fully amused, then this a great option. Your baby will start to master early motor functions, including hand-to-eye coordination, while at the same time having lots of fun in this bouncer-assisted seat. You get the unit itself with its deep comfy cradle seat, a removable washable headrest, 3-point safety harness and full assembly instructions. You also get the removable toy bar that comes with 3 soft play toys for extra sensory stimulation that your baby can learn to reach, bat and grasp, increasing and developing their hand to eye co-ordination. Batteries are not included. Featuring interactive toys including a butterfly mirror, flower rattle and flower crinkle, these brightly designed hanging toys will help increase your baby’s hand-to-eye coordination and offer plenty of visual stimulation and enjoyment. This unit also comes with its own on-board music center that has 5 melodies to select from as well as 3 different soothing sounds, all of which can be volume-control operated. Featuring a fully removable and washable headrest as well as a 3-point safety harness, this bouncer is a great option for busy parents who want to keep their baby safe, comfortable and fully amused. Its battery operated and additionally features vibration motion to ease and soothe your baby. If you are still looking for the Hello Kitty design features but you prefer to have a unit that takes rechargeable batteries, you could opt instead for the Baby Trend Pinwheel Bouncer. It still has all the great functionality you’d expect from a Baby Trend designed Bouncer but has rechargeable batteries so it’s an environment-friendlier option. 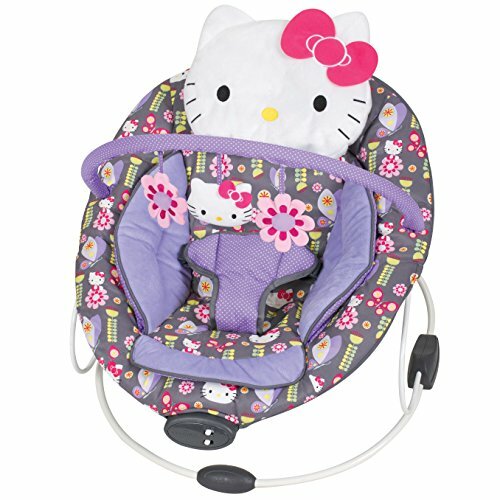 If it’s a bright and fun, feature-packed Bouncer that you are looking to purchase, then the Baby Trend Hello Kitty Bouncer is a great option that will keep your baby both safe and fully amused. Easy to set up and lightweight to carry around, you can move the bouncer and your baby to wherever you are so that you can get on with your chores or other activities while safe in the knowledge that your baby is fully protected and also enjoying some early development too. All parts can be wiped down and cleaned with a damp cloth while the headrest is machine washable. This really is the ultimate in fun and functional designs and features that both you and your baby will love to use time and time again.